The Motorola Model CP200 s just what you need on that job site. Whether indoor or outdoor, this radio delivers it's crisp and audible signal with confidence. Versatile and rugged, the CP200 will not only provide clear audio transmission but will stand up to the most demanding physical conditions. Motorola built this water resistant unit with heavy duty on-site work in mind. When profit is on the line and time cannot be wasted asking for repeated calls, why pay for an inferior radio which you will only have to replace? You'll make good use of this radio's channel selection and multi analog and digital code possibilities. 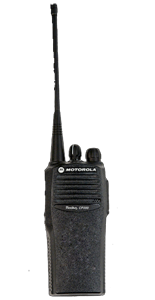 The 2-Pin Single-Wire Surveillance Earpiece from Motorola provides discreet and efficient communication for business-class 2-way radios, ideal for use in hospitality and retail venues. The earpiece provides crisp incoming audio with excellent intelligibility. The clear coiled acoustic tube and rubber earbud provide lasting comfort, even during extended use. An inline microphone and push-to-talk button are placed conveniently on the cable for quick and efficient communication and clear vocal pickup.